Three of the top five fastest growing cities in the country are here in Texas, and explosive population growth puts a lot of pressure on our electric grid to keep up with demand. Fortunately, the state’s main grid operator, Electric Reliability Council of Texas (ERCOT), has done a great job of keeping the lights on, and new building codes are ensuring less energy use in the thousands of new houses that are being constructed. As more and more people flock to the Lone Star State, there is significant potential for energy efficiency to reduce pollution and energy bills for Texas families. But in a report released last October, ERCOT overestimated the cost of energy efficiency in Texas – by more than two times – and understated by about seven times the amount we are on track to achieve. ERCOT’s estimates do not acknowledge Texas’ reality: Energy efficiency, and other sources of clean energy, are already on the rise. The ERCOT report aimed to assess what the Clean Power Plan – which sets the nation’s first-ever limits on carbon pollution from power plants – would mean for Texas’ electric makeup. In the plan, each state is empowered to develop an individualized, flexible state plan to meet its carbon reduction goals. Although recent action from the Supreme Court temporarily paused the enforcement of the Clean Power Plan’s deadlines while the courts review it, EDF remains confident the framework rests on rock-solid legal and scientific footing. Texas leaders should move forward with compliance planning in order to maximize the benefits of clean electricity – and be in the best position to comply once the Clean Power Plan is upheld. To determine the Clean Power Plan’s impacts, ERCOT used various potential pathways, or “scenarios,” for compliance in its report. In all four scenarios highlighted in its press release, the grid operator assumes energy efficiency savings during 2013-2030 that aggregate to only one percent of the state’s retail electricity sales by 2030. 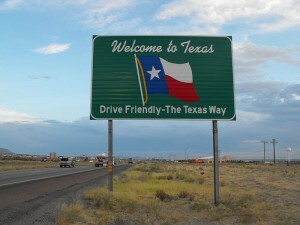 But one percent does not reflect the significant efficiency progress already underway in Texas. (Nor does it line up with a separate ERCOT study, in which long-range planners predict energy efficiency will lower overall demand by 3.5 percent by 2031, based solely on existing trends.) In actuality, state building codes and existing utility programs – already in place – will add about seven percent savings in 2030 (see table below). This higher estimate lines up nicely with one scenario in ERCOT’s report, which assumes seven percent energy efficiency savings. However, ERCOT largely dismisses this realistic pathway because it predicts a massive energy efficiency price tag: $31 billion in gross costs – or initial investments – by 2030. ERCOT cites an EPA source to reach its $31 billion estimate, but this source examines a very narrow set of energy efficiency measures that don’t reflect the broader and far more cost-effective suite of energy efficiency opportunities that exist in Texas. We believe ERCOT should use its own intimate knowledge and expertise on Texas’ electricity landscape to examine efficiency opportunities, as well as others in Texas that have expertise in this area. We believe ERCOT should use its own intimate knowledge and expertise on Texas’ electricity landscape to examine efficiency opportunities, as well as others in Texas that have expertise in this area. Regardless, deeper digging into the upfront costs in Texas reveals that ERCOT overshoots gross costs more than two times over – they are actually $14.1 billion over 18 years. That’s no small difference: Imagine if you were buying a car and the dealer tried to sell it to you for $45,000 rather than its real price of $20,000. Plus, these costs are attributable to utility programs and building codes that are already on the books even without the Clean Power Plan. That means Texas should get to seven percent energy efficiency with zero additional costs attributable to compliance with the Clean Power Plan. And recent research sponsored by SPEER, the Southcentral Partnership for Energy Efficiency as a Resource, confirms reduction in consumption of as much as 10 percent of 2030 demand could be achieved with relatively modest program changes. Moreover, ERCOT’s decision to only take into account the initial investment price is misleading, because energy efficiency yields savings year after year that offset the upfront investment. Indeed, people and businesses save money from investments in energy efficiency because ultimately it provides savings beyond the cost. For example, if you spend $1,000 to insulate your attic and save $200 per year in lower heating and cooling bills, after five years, the continued savings are money in your pocket for the life of the home. Similarly, the Lone Star State’s energy efficiency savings of seven percent would provide customers more than $5 billion in net savings over and above initial costs by 2030. (To understand how we reached these conclusions, please see our guide here.) SPEER’s research also indicates that undertaking a more aggressive energy efficiency posture would put downward pressure on energy prices, while avoiding the need to upgrade transmission and distribution infrastructure as well. Our results echo a common theme among robust analyses from the world’s most reputable organizations on the subject: energy efficiency is an extremely cost-efficient energy resource. According to the major private investment firm Lazard, energy saved as a result of energy efficiency investments are realized at an average cost of 0-5 cents/kilowatt hour (kWh), making it by far the cheapest energy resource. The American Council for an Energy-Efficient Economy (ACEEE) finds the cost in Texas is 2.6 cents/kWh, and robust analyses from other world class think tanks, such as Lawrence Berkeley National Laboratories, lead to similar conclusions. Yes, implementing energy efficiency entails upfront costs, but so does building conventional power plants. 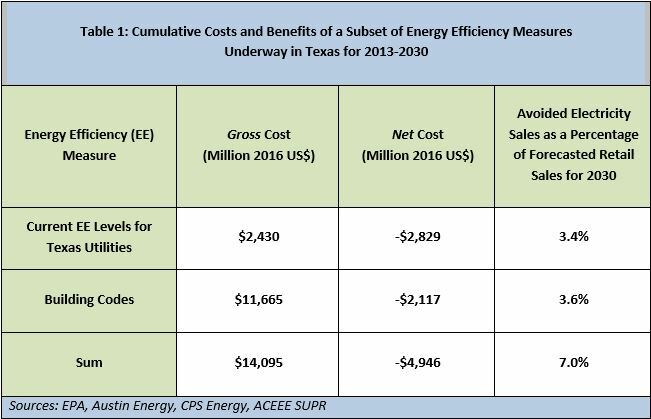 ERCOT’s report significantly overestimates how much money seven percent energy efficiency would require, and doesn’t acknowledge the savings to be realized. In sum: The initial efficiency costs – less than half of ERCOT’s predictions – ultimately will result in $5 billion in net savings, all happening under business as usual. The Clean Power Plan further encourages the growth of energy efficiency – with Texas standing to reap the rewards. In its October 2015 report, ERCOT said, “Energy efficiency is a potentially cost-effective method for Clean Power Plan compliance.” We couldn’t agree more. Even on its own, efficiency is a cost-effective means of reducing pollution, waste, and electricity bills. It’s time to recognize the unprecedented energy efficiency opportunity at hand – so all Texans can have a cleaner, healthier state. In an upcoming post, we’ll go beyond the economics of energy efficiency and explore its many other benefits, including grid reliability improvement and water conservation. We also will examine programs and initiatives that could drive efficiency higher and Clean Power Plan compliance costs lower. This entry was posted in Clean Power Plan, Energy Efficiency, Texas. Bookmark the permalink. Both comments and trackbacks are currently closed.